“POPE JOHN PAUL II IS THE REAL DEAL"
Fig. 1—Aug. 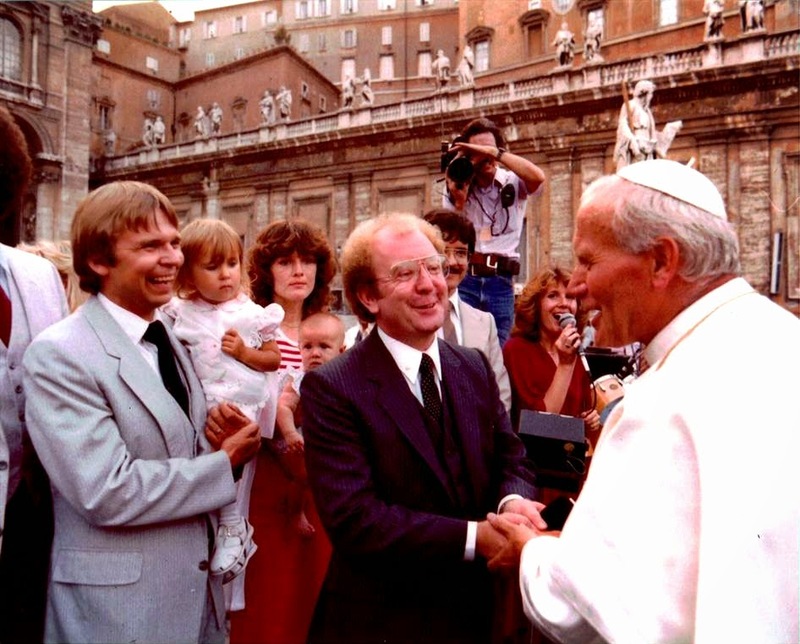 13, 1980, Living Sound Vatican concert and audience with Pope John Paul II (formerly Cardinal Karol Woytła). 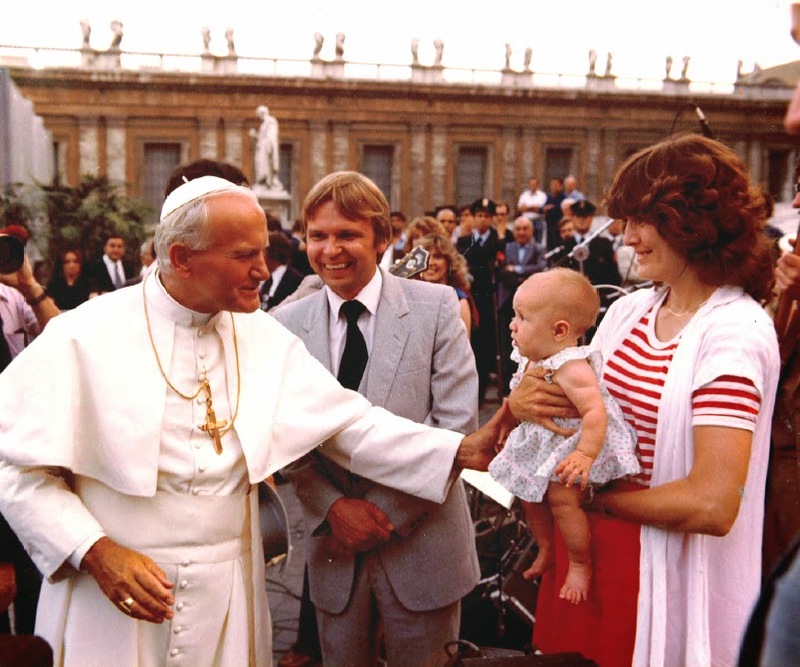 Pictured L/R Pope John Paul II, Mike McKibben (behind His Holiness), Joel Vesanen (Team III Road Manager), Baby Carrie McKibben (four months old), Nancy McKibben, Living Sound Team III (in background). This photo was captured at the foot of the steps of St. Peter’s Bascilica. Fig. 2—Aug. 13, 1980, Living Sound Vatican concert and audience with Pope John Paul II. 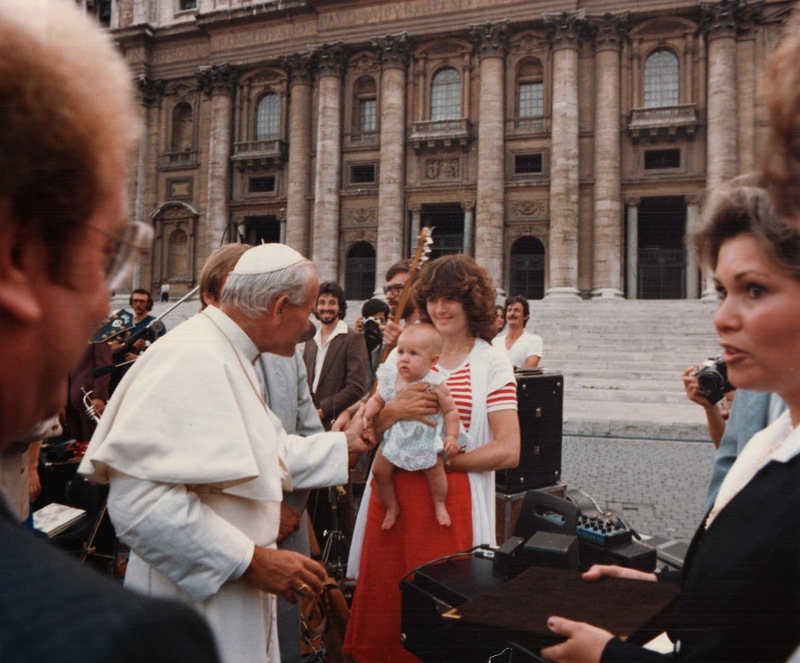 (L/R) Joel Vesanen, Baby Anja Vesanen, Nancy McKibben, Baby Carrie McKibben, Terry Law (foreground), Michael McKibben, U.S. TV videographer, Pam Faye (singer), Pope John Paul II. (Apr. 26, 2014) —A cool YouTube video titled We Can’t Live Without Each Other appeared about a year ago. It was produced by Leader Technologies’ CEO, Michael McKibben, and some former colleagues. It chronicled the work of a spunky Gospel group named “Living Sound.” Comprised of four different music "teams," they performed around the world, including the former Soviet Union. That's right, back when militant atheism was communist government policy. 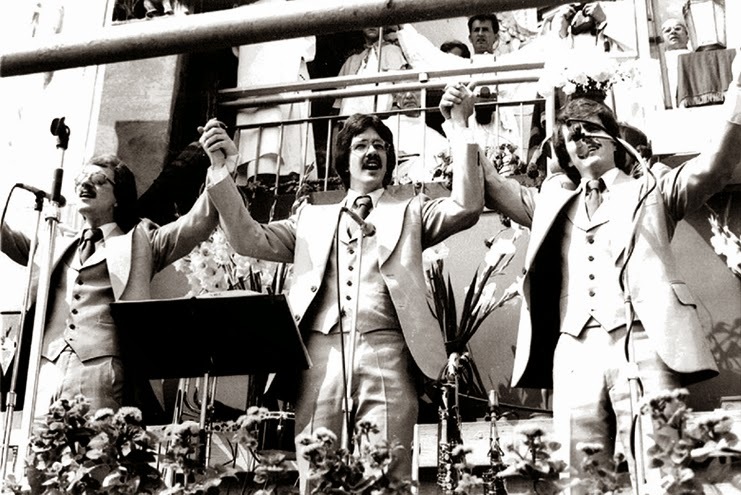 Remarkably, this Christian group even performed on Soviet TV and on the official 1980 Moscow Summer Olympic film. McKibben was their European Director between 1997 and 1982. Full citation: We Can't Live Without Each Other (Hам не жить друг без д руга) music video, A. Pakhmutova (А. Пахмутова), N. Dobronravov (Н. Добронравов) , N. McKibben, Living Sound, 1980, Melodiya Records / Mosfilm / Evgeny Ginzburg-CT USSR. Living Sound achieved many firsts, including organizing the first integrated concert tour in Apartheid South Africa with Andrea Crouch and the Disciples. They were also the first (and probably only) American Gospel group to perform on national Soviet TV during the height of the Cold War. On the eve of Pope John Paul II’s canonization, we thought readers would appreciate knowing a bit more about Michael McKibben, the real inventor of social networking. It appears he has a saint in his camp—the man who helped bring down communism behind the Iron Curtain. Living Sound was close to Polish Cardinal Karol Woytła. They collaborated during the decade of the 70’s when Cardinals Wyszynski and Woytła, and the People of Poland with them, were standing strong against communist ideological aggression. Fig. 4—Living Sound, ca. 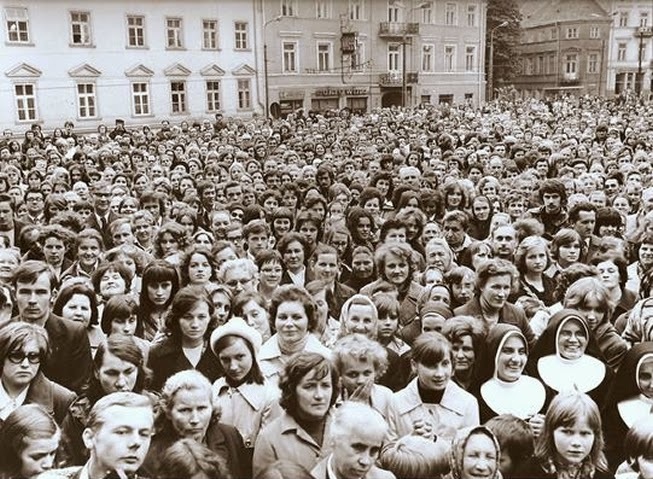 Aug. 15, 1974, sang to a gathering of 300,000 pilgrims at the Festival of the Black Madonna at Jasna Góra Monastery, Częstochowa, Poland. Cardinals Wyszynski and Woytła sat about where the photographer is standing in this photo. Pictured (L/R) are translator Ryszard Pruskowski, Carol Tedder (One Republic Ryan Tedder's aunt), and Tim Hoover. Michael McKibben is playing trombone in the band to the left of this shot. 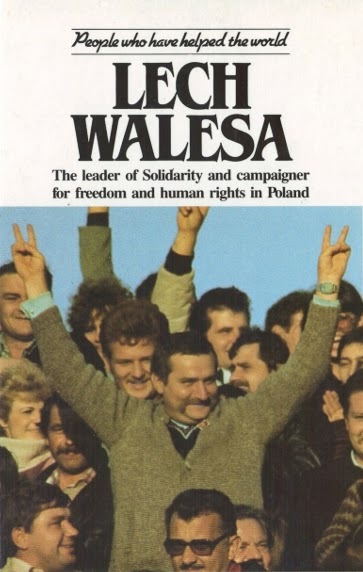 Fig 3--Lech Walesa was the man who led Solidarity, the first free trade union in the Communist block. He led his followers in a non-violent opposition to the state and its police and was inspirational in creating the climate that finally enabled Poland to free itself from the power of the Communist party. Gdansk, Poland, ca., late 1980. Fig. 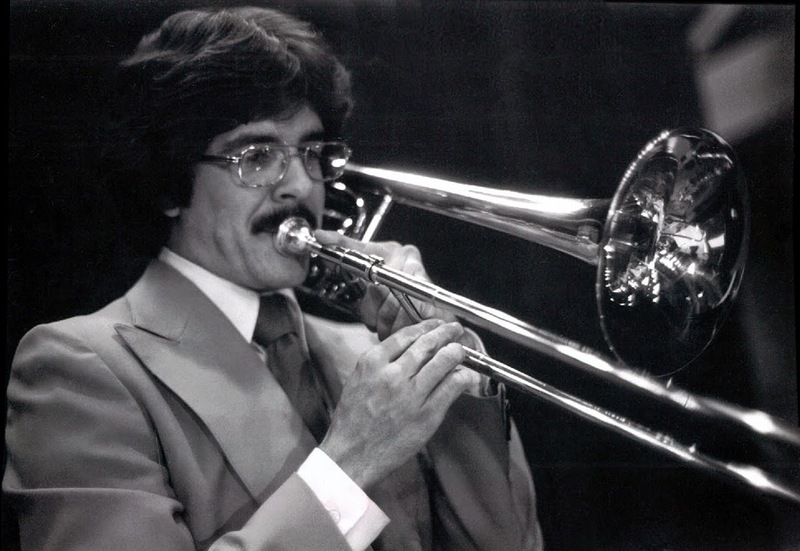 5—Michael T. McKibben, Living Sound trombonist, ca. 1975. Fig. 5—Cardinal Karol Woytla, ca. 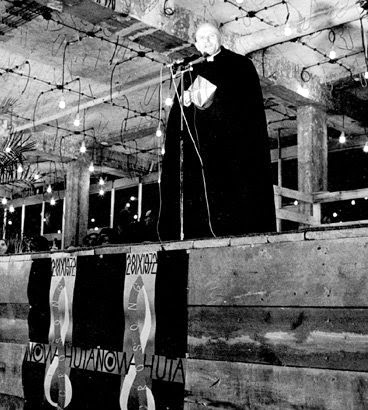 Oct. 28, 1972, speaking at Nova Huta cathedral while under construction. Three years later, Living Sound sang on this very stage, still under construction by the people of Nova Huta. The town was being built by the Communists to be free of religion. Cardinal Woytła and the parishioners had other ideas. The Cardinal and his parishioners won. “The next day, we traveled to Krakow to meet with Cardinal Woytła at his residence. My wife, Nancy, had asked him for an interview for an article she was writing about our Polish tours. Back then, few Americans knew much about the plight of the Polish Church, so we wanted to tell them. We asked Cardinal Woytła for a letter of recommendation to the American Church. I will never forget his reaction. Nonplussed, he asked in slight amusement, “Who cares about the opinion of an out-of-the-way Polish cardinal?” He was not pretentious. Fig. 6—Cardinal Karol Woytla (Right) ca. 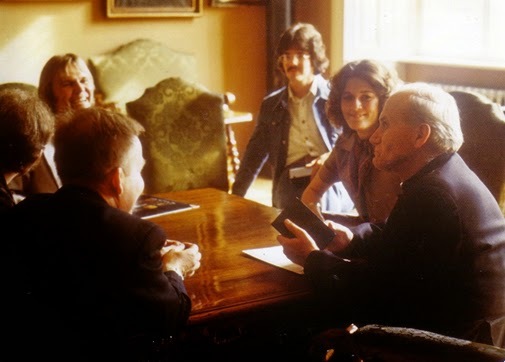 Sep. 30, 1975, meeting at his residence in Krakow, Poland with members of Living Sound. R-L: Cardinal Karol Woytła, Nancy McKibben, Michael McKibben, Joel Vesanen, Ryszard Pruskowski, Fr. Jan Palusinski (Sacrosong). "Their repertoire as well as the visible emotional involvement in the Gospel, their artistic expression during the Sacrosong, and the various concerts have made a positive impression on the Polish Catholic listeners. 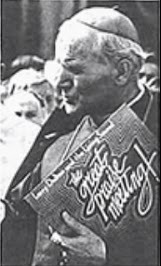 Their attitude awakens courage among the Polish youth to proclaim the Word of God... also proves that the salvation of every man is our common task... for the furthering of their Godly work and this mission, I bless from my heart, the Living Sound." "In 1980, His Holiness invited us to Rome for an audience. 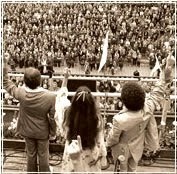 On August 13, 1980 we sang to 60,000 in Vatican Square for an hour before the Pope’s regular Wednesday audience. We have a photo of him greeting Living Sound, and blessing our four-month old daughter, Carrie." See Fig. 1 above. "The Vatican Curia said they’d never seen anything like it. We were a fully electrified jazz-rock/pop style group pumping out toe-tapping Gospel music through the Vatican public address system. The Pope let us park our bus at the steps of St. Peter’s. We ran a 1-inch power cord out the front door of St. Peter’s and down the long steps to our gear set up next to his podium." "Several weeks earlier, I had traveled to Rome with Randy Innes (now a Superintendent of the United Methodist Church in North Carolina) to make the final arrangements with the Vatican. Our host was Monsignor Ivan Dias, who is now a cardinal in India. Monsignor Dias told us a humorous story about the tone John Paul II set quickly for his leadership." Fig. 8—Cardinal Karol Woytla, ca. Aug. 14, 1974, holds the Living Sound LP "The Great Praise Meeting" just after Living Sound had sung before a crowd of 300,000 gathered for the Festival of the Black Madonna at Jasna Góra Monastery in Częstochowa, Poland. This photo was one of the few available in the West following Cardinal Woytla's election to the papacy on Oct. 16, 1978. Michael McKibben, Living Sound's European Director, says it was used widely in the British press to carry the first news of his election. Turning to Leader’s battle with Facebook, we asked McKibben if he thought his association with Saint John Paul might make a difference in finding justice. “How Saint John Paul’s prayers will affect the unconscionable conduct of Facebook is in God’s hands. In the end, they'll answer to Him, just like us. Our job is to do what’s right, every day. We'll also ask Saint John Paul, and other saints who have faithfully run the race before us, for their prayers. Then, we'll leave the results to God." "A great philanthropist Rose Totino (of frozen pizza fame) was once criticized for being too generous. She responded: 'I’ve never seen a U-Haul behind a hearse.' In the end, we all will stand before God with only our lives and conduct to answer for. My prayer is that my shareholders receive their just rewards, here and now. We already know what God thinks about what Facebook has done: Thou shalt not steal; Thou shalt not bear false witness. Our U.S. laws are based on these timeless commandments. Now we just need a government and legal system that protect them, here and now.” McKibben concluded. Who cares about the opinion of an out-of-the-way Polish cardinal? Maybe no one, but what about the prayers of a saint? Pray for us, Saint John Paul. Fig. 9—Living Sound Vatican Audience and Concert Aug. 13, 1980, L/R: Terry Law, Randy Faye, Team III (background), Pope John Paul II, Joel Vesanen, John Paul II, Duane Nichols, Dave Berry, Baby Carrie McKibben, Nancy McKibben, Jan Law (foreground). Fig. 10— Living Sound II Horn Section singing to ~300,000 pilgrims at the shrine of the Black Madonna of Częstochowa, Poland ca. Aug. 27, 1975. Living Sound Team II, L/R: Larry Kaemmerer (trumpet & flugelhorn), Michael McKibben (trombone), Dan Murdock (woodwinds). Living Sound was invited and hosted by Cardinals Stefan Wyszynski and Karol Woytła. Fig. 11—Living Sound Team II Sacrosong Concert Crowd, Przemyśl, Poland, Sep. 22, 1975. According to Michael McKibben, an estimated 20,000 people jammed the streets to hear Living Sound, They set up their musical gear on a specially built stage from which this picture was captured. Cardinal Karol Woytła was the patron of Sacrosong; Fr. Jan Palusinski was the director. 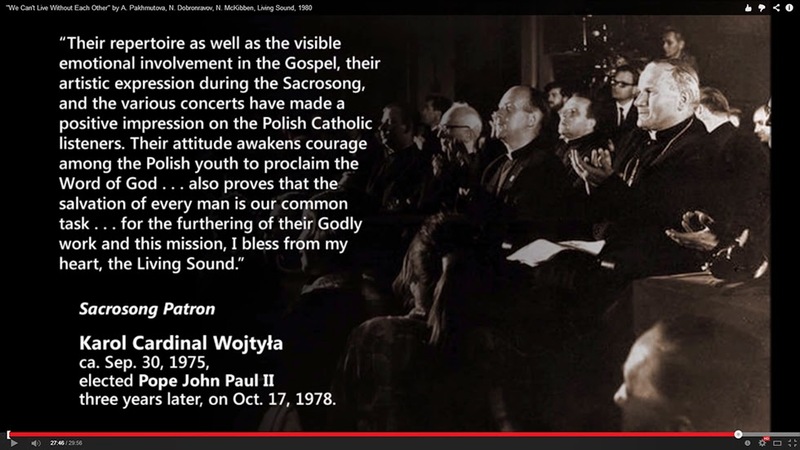 McKibben said he was approached by a known Polish secret policeman during this concert before the sponsoring parish priest told the man to leave Living Sound alone. Fig. 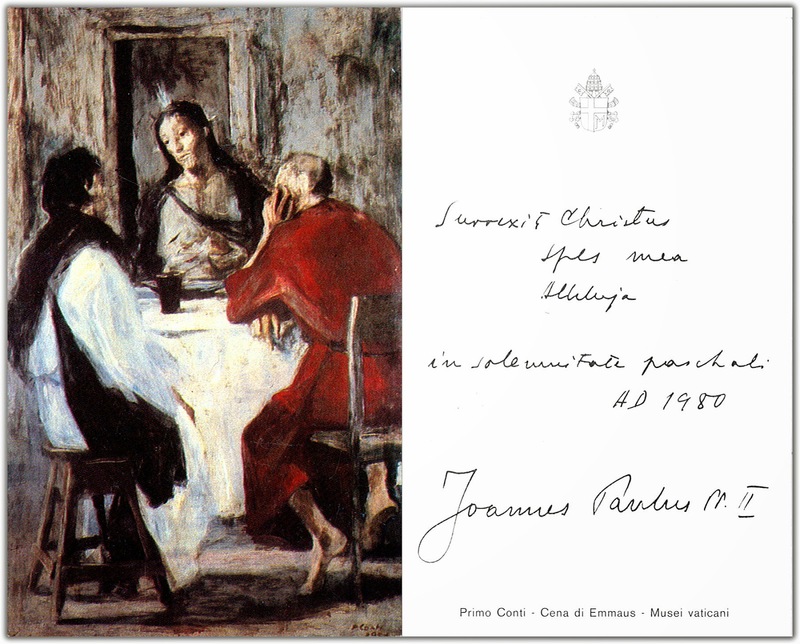 12—Pope John Paul II's Easter (Paschal) Blessing, 1980. Given to Michael & Nancy McKibben after Living Sound's August 13, 1980 audience and concert in St. Peter's Square. (May 7, 2014)—Castlight Health filed an S-1 Registration indicating it plans to go public. What's wrong with this story? First, the company's owner and founder, Todd Y. Park, is the current U.S. Chief Technology Officer who embedded Castlight software in Healthcare.gov / Obamacare when he was HHS CTO. Second, the Facebook Cartel is running the show. It's the same cast of characters that stole Leader Technologies' invention, corrupted our federal courts and corrupted our agencies: Fenwick & West LLP (Leader's former attorney), Goldman Sachs, and Morgan Stanley. Will Obama's regulators at the S.E.C., Commerce Dept. and Justice Dept. stop this evident double-dealing and corruption? The S-1 confirms the overwhelming presence of the Facebook Cartel at Castlight: See page 91, 92, 112. David Ebersman (Facebook CFO), Robert Kocher MD (architect of Obamacare; Venrock) and Ann H. Lamont (Nat. Venture Cap. Assoc., Meritech [large Facebook shareholder], Oak Investments), Fidelity. Founder Todd Y. Park's holdings are not disclosed. Nondisclosure of a material party, especially the United States Chief Technology Officer, is fraudulent misrepresentation. Commerce Secretary Penny Pritzker holds up to $23.4 million in Goldman, Morgan Stanley and JPMorgan, the underwriters, she is clealy feathering her own nest. Attorney General Eric G. Holder holds 11 Fidelity Fund investments which makes him a beneficiary of the Castlight offering. Bottom line, our securities regulators are living in the Castlight nest with the underwriters. This entire offering is the definition of corruption. May 7, 2014 Update: Dear Readers, this has been a busy week for AFI investigators while you hopefully enjoyed the Saint John Paul post. Much more proof of the endemic corruption surrounding Leader v. Facebook and the administration has emerged. AFI researchers are verifying it. Pay attention to Theodore B. Olson, Gibson Dunn LLP. He was interviewed on 60 Minutes Sunday. He represents BP against the Gulf Coast oil spill victims. Olson is a close, long time collaborator of Facebook's attorney in Leader v. Facebook, Thomas G. Hungar, and Chief Justice John G. Roberts, Jr.
We believe the Leader v. Facebook judicial corruption scandal, the Benghazi cover-up and the IRS scandal, will all point to the same conspirators in the administration. One thing is for sure, the scandals are all driven by corrupt lawyers. A Brit pointed out the other day that half of the members of the Senate these days are attorneys, as compared to a fraction of that proportion in other Western democracies. We feel an attorney joke hairball coming up, so we'll stop for now. Stay tuned. AFI Contributing Writers. Took his Russian Digital Sky Company, a Goldman Sachs Moscow partner, from $0 to $12 billion (with a B) in just two years. Milner is Facebook's second largest investor. Milner purchased a $120 million mansion in Palo Alto, CA. Obama's HHS nominee, Sylvia M. Burwell, holds multiple stocks in Milner's company Mail.ru through her T.Rowe Price and Allianz holdings. See financial disclosure below. President Obama is off in Asia promoting the TPP (Trans Pacific Partnership). This administration has conducted these negotiations in shrouds of secrecy using their crony lawyers goose stepping through the Rose Garden. Like Obamacare, proponents want it implemented without robust debate. Insiders indicate more free speech and intellectual property rights will be flowing to big infringers in this so-called "reduction of trade barriers." Sounds good, doesn't it? If we have learned nothing about the rhetoric of this administration, we've learned that they consistently say one thing to mask a secret agenda. In war its called "misdirection." Psychologists call it "pathological lying." The Bible calls it "the sin of bearing false witness." The devil is in the details. Demand full debate and transparency before any such decisions are made. If Obama implies Usmanov and Usmanov implies Putin, then Obama implies Putin. Perhaps this unholy alliance explains why everything about this Ukrainian crisis is squirrely. For many years, President Obama's Facebook Cartel relied upon Larry Summers' protégé, oligarch Alisher Usmanov, to feed Facebook billions of dollars of dubious Russian cash to pump Facebook's pre-IPO valuation to record levels. President Obama also relied upon the Facebook platform to micro-target LOFO voters to get elected. Vladimir Putin is well known to be a under the thumb of Russia's oligarchs, Alisher Usmanov chief among them. While politicians on both sides yack away about the Ukrainian Crisis, they are mere mouthpieces for the off-the-books dealings among American and Russian oligarchs on both sides of the Atlantic. In America, its the Facebook Cartel driving Obama (in coordination with their partners in Moscow). In Russia it's the Facebook-look-alike Vkontake Cartel (probably using the same code as Baidu's and Facebook's, provided by Fenwick & West LLP, with their partners in America) run by Alisher Usmanov. Warning to Ireland: Just recently Facebook announced it is trying to persuade banking officials in the Republic of Ireland to establish the Facebook Cartel's long planned virtual currency, formerly known as Facebook Credits, then Bitcoin, and digital credits. Keep in mind we're really not talking about Facebook per se. We're talking about James W. Breyer, Accel Partners LLP, IDG Capital China, Goldman Sachs Moscow, Alisher Usmanov, JPMorgan, Morgan Stanley, State Street Corp, you know, the banks that the American people "bailed out" in 2008. Whatever the latest name of the day, it is still putting lipstick on a pig. One cannot build a sound economic house on a corrupt moral foundation. The bad guys don't understand that ethic. Greed, avarice and power-mongering are age-old vices. They are short lived as philosophical underpinnings for economic and social vitality. Run. Update: Apr. 19, 2014—Why isn't President Obama Sanctioning Alisher Usmanov and Yuri Milner—Lawrence "Larry" H. Summers' Russian oligarch protÉgÉs? hiding secrets of his & Zuckerberg's dubious origins? The Richest Oligarch in Russia; Facebook's largest outside investor at the IPO. Two Russian oligarchs are conspicuously missing from President Obama's Ukrainian sanctions list: (1) Alisher Usmanov and (2) Yuri Milner. Bloomberg labels Usmanov as Russia's richest man. Milner is his sidekick. Usmanov and Milner, along with Facebook COO Sheryl K. Sandberg, are protégés of Obama's bailout director, Lawrence "Larry" Summers. While Summers, Sandberg and Milner were at the World Bank in 1991-1993, they helped orchestrate the disastrous Soviet voucher system that created the corrupt oligarch system in Russia. Usmanov and Milner pumped billions of dollars, maybe tens of billion, into private, unregulated Facebook "dark pools" investments underwritten by Goldman Sachs. This activity was blessed by another substantial Facebook "dark pools" investor, S.E.C. Chair Mary L. Schapiro. Summers also oversaw over $13 billion GIVEN to Goldman in bailout funds during this period. Some of it went overseas, probably to Usmanov and Milner, and it is now suspected that it was used to buy Facebook stock through Usmanov's Moscow partner, Goldman Sachs. This activity helped pump Facebook's pre-IPO valuation to $100 billion. Facebook's micro-targeting of the LOFO vote (low information voter) is credited with getting President Obama elected in 2008 and 2012. What skeletons in the closet is President Obama hiding in the omission of his favorite Russians, Usmanov and Milner, from his Ukrainian sanctions list? We think Usmanov and Milner know President Obama and Mark Zuckerberg/Facebook are the best deals their dirty money could buy, with more than a little coaching from Comrade Summers. Fig. 1—Sylvia M. Burwell promised to tell the truth about her up to $10 million in financial holdings, including HealthCare.gov vendors as well as Russian and Chinese social networks tied to the Facebook cartel, and therefore to the NSA. It’s a nasty web of conflicts of interest (illegal for government officials if not disclosed and waived). Let’s see if she does. Click here to download Sylvia M. Burwell's 2012 Financial Report and Analysis. (Apr. 13, 2014)—AFI investigators have now analyzed hundreds of financial disclosures from the judicial and executive branches. Sylvia M. Burwell's 2012 financial disclosure is reported below. She declared her net worth at up to $10 million. We discovered this weekend that much of it is held in the same Facebook “dark pools” as a select list of a dozen senior White House officials and Leader v. Facebook judges. On Friday, President Obama nominated Burwell to replace Kathleen Sebelius as Secretary of Health and Human Services (HHS). Our investigation uncovered substantial conflicts of interest that may require her to divest of many of her holdings. Public impartiality is her duty. Burwell holds stock in Booz Allen HAMILTON and Athenahealth, that are both vendors to HealthCare.gov. Obama’s Chief Technology Officer, Todd Y. Park, is the founder of Athenahealth. He also worked for Booz Allen. Todd Park’s brother, Edward Y. Park is their current chief operating officer. Burwell also holds stock in HealthCare.gov no-bid contractors CGI, Inc. and Accenture, as well as Boston Scientific, a collaborator to HealthCare.gov and the Facebook cartel. These companies have troubling ties to Chinese and Russian social networks, Baidu, Yandex and Mail.ru. These companies are closely tied to Facebook, Goldman Sachs Group and other Facebook financiers incl. T.Rowe Price, Baillie Gifford, Vanguard and Fidelity. Facebook’s cooperation with the NSA makes these byzantine alliances all the more troubling. Burwell, appears to be a water carrier for the Facebook cartel. If confirmed, she will replace Kathleen Sebelius who oversaw the disastrous HealthCare.gov roll out. Fig. 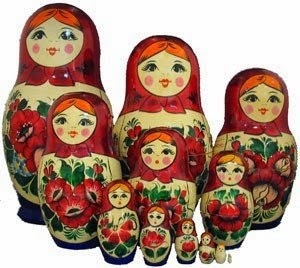 2—Which of these Russian nesting dolls holds the secret? See proof of the Facebook Cartel's nesting doll deceptions below. The Obama White house appears to be organized like a set of Russian nesting dolls. The outer doll is the public face, but the nasty stuff is inside. This would explain why no one gets fired in this administration. They’re just following orders. An exposé of the nested doll strategy among Obama’s Facebook cartel may help readers better interpret Burwell’s holdings. However, if you want to jump to the Burwell analysis below, click here. 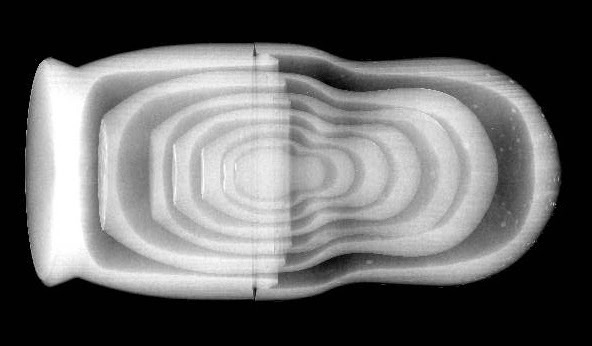 When one studies hundreds of reports like we have, the data starts to tell us its secrets. Our first observation is that the financial reporting mechanism is flawed. It invites fraud and misrepresentation. Essentially, the report gives a blessing to the superficial, somewhat meaningless reporting of only the outer doll. Nonetheless, if one persists in analyzing the underlying data, which is extremely time consuming, the outer doll eventually yields her secrets. The vast majority of actual stock holdings are nested within mutual funds. Judges, bureaucrats and politicians hide their true holdings inside the funds. The uninformed thinking among our public officials is that judges and government officials do not have to report their stock holdings within mutual funds for the purpose of recusal. Unscrupulous lawyers support this notion. However, it is dead wrong according to any honest reading of the conflict of interest laws. Conflict of interest laws are founded on the concept of avoiding impropriety and the appearance of impropriety. For example, see Canon of Conduct for U.S. Judges. Any interpretation that violates this bedrock principle is wrong, even if it is written by a committee of judges. This circumstance is another proof that the concept of attorney and judge "self-policing" is broken. This lack of ethical discipline contributes to America's growing lawlessness. A waiver from financial conflicts disclosure for mutual funds is wrongheaded. It would be like me selling you a pair of jeans for $50, but you know there is a $1,000,000 check made out to you in the back pocket. According to the wrongheaded interpretation, you only have to disclose the $50 value of the jeans, while you secretly know the true value is $1,000,050. For public officials intent on rigging the judicial system, this nesting appears to serve two main purposes. First it provides an “I didn’t know” or “the Judicial Conference says I don’t have to tell you” excuse for not disclosing holdings. Second, it enables bribery, coercion and insider trading of and by judges. Promises of a big Facebook IPO were dangled in front of the Leader v. Facebook judges. The bribers could not get away with giving the judges Facebook stock directly, so they nested Facebook holdings inside crony funds, like Fidelity Contrafund. Fidelity fund manager Robert C. Ketterson was a fellow director of the National Venture Capital Association (NCVA) with James W. Breyer, Accel Partners LLP chairman, Facebook’s then chairman, and Facebook’s largest shareholder and beneficiary. Also serving the NVCA with Breyer and Ketterson were Ann H. Lamont and Anne Rockhold. Lamont is closely tied to Todd Y. Park and Robert P. Kocher, MD. Obamacare and HealthCare.gov architects, and Athenahealth and Castlight Health, founded by Todd Y. Park and technology supplier to HealthCare.gov. To our knowledge, Burwell has not disclosed any of these conflicts of interest. In Leader v. Facebook, substantial amounts of Facebook stock was held by the judges and regulators, sometimes in Doll #2, sometimes in Doll #4 and so on. 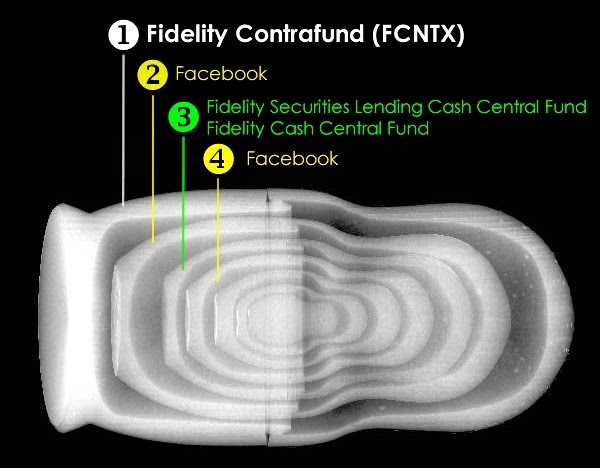 For example, a prominent pre-IPO investor in Facebook was Fidelity Contrafund (FCNTX). Federal officials holding Contrafund include Chief Justice John G. Roberts, Jr., Circuit Judge Kimberly A. Moore, Federal Election Commission Chairman, John J. Sullivan, Commerce Secretary Rebecca M. Blank, Attorney General Eric H. Holder and Office of Management and Budget Director, Sylvia M. Burwell—now nominated to replace Kathleen Sebelius as Secretary of Health and Human Services. Note that the total numbers of holders of Fidelity Contrafund in this administration and the Leader v. Facebook judiciary is limited to a select few insiders. The hand waiving we’ve seen when confronted by these facts is “Well, Contrafund is a popular fund. Everybody’s got some.” No they don’t. We’ve checked. Out of over 200 financial disclosures we’ve analyzed, only 11 hold Fidelity Contrafund. Those 11 are all senior Obama officials or Leader v. Facebook judges. These people likely had insider information about Contrafund’s Facebook investing plans. Fig. 4—Fidelity Contrafund (FCNTX) is held by Chief Justice John G. Roberts, Circuit Judge Kimberly A. Moore, OMB Director Sylvia M. Burwell, FEC Commissioner John J. Sullivan, Commerce Secretary Rebecca M. Blank and Attorney General Eric H. Holder. Fig. 5—Fidelity Low-Priced Stock (FLPSX) Fund is held by Chief Justice John G. Roberts, Jr., Circuit Judge Kimberly A. Moore, Commerce Chief Counsel Cameron F. Kerry and Army Secretary Donald M. Remy. Leonard P. Stark, Photo: U.of Del. Leader v. Facebook judge Leonard P. Stark holds seven Fidelity investments, all of which hold large investments from NESTED Fidelity Securities Lending Cash Central Fund and Fidelity Cash Central Funds, both large Facebook pre-IPO investors. He did not disclose these conflicts, despite his promise to do so during the case, at his U.S. Senate confirmation hearing on Apr. 22, 2010: "I screen cases as they are referred to me for potential conflicts of interest... My practice has been to recuse myself if I have a close relationship with any of the parties, identified witnesses, or counsel that would interefere with my neutrality or compromise the appearance of justice." PDF p. 84. 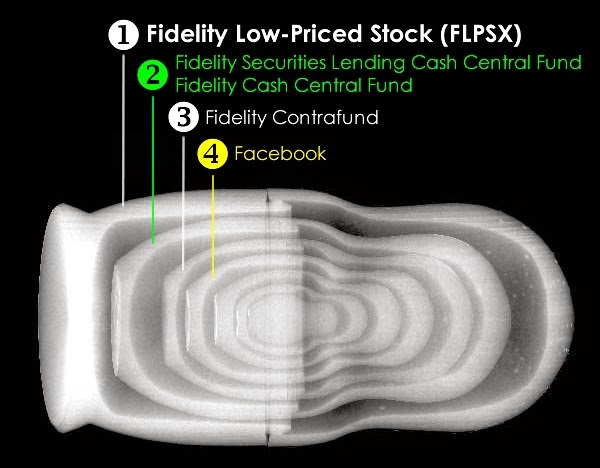 Fidelity Contrafund made a large investment in private Facebook before the IPO. As of Jun. 30, 2012, Contrafund had $413,476,551. These investments were brokered by Goldman Sachs in unregulated Wall Street “dark pools.” See 'Fidelity's Danoff Bets on Facebook'' by Miles Weiss, Bloomberg, Jun. 1, 2011. Also see our previous post on dark pools at “Wall Street Manipulation of Judges, Politicians, and Regulators Exposed by Leader v. Facebook Judicial Corruption” by Americans For Innovation, Jan. 7, 2014. According to Morningstar, a total of 16 Fidelity funds have invested $818,228,924 in Facebook. The numbers are staggering. Any lawyerly excuse for not disclosing the conflict rings hollow. 1. Is nested investing illegal? Generally No. Unless you're hiding insider trading, then its fraud. 2. Should nested stocks be disclosed when the judge’s holdings will be benefited by decisions for one party or the other? Yes. 3. Otherwise, what is the point of disclosing a mutual fund at all? The devil is in the details. The courts are protecting the devil. The name of the fund becomes meaningless unless one is required to disclose the substance of the holding. The Judicial Policy, Sec. 106, Mutual Funds opinion says that the stocks held in a mutual fund are not a financial interest unless you manage it personally. Wouldn't that be everyone since no one forces the judge to purchase a particular mutual fund and its contents? The decision to purchase the fund is enough to force disclosure, even under the dubious Sec. 106 revised definition. A judge chooses a mutual fund precisely because of the expected performance of returns of the stocks and bonds managed by the fund. Each fund issues a report of its holdings twice a year, so this guideline against disclosure is suspiciously flawed. The holder gets reports of the holdings, therefore a judge holding the fund should always disclose when a litigant comes before him in which he will benefit from favorable rulings. Self-interest induces a judge consciously or subconsciously to provide favorable rulings for his or her own holdings. That is precisely why full disclosures of conflicts of interest, and recusals (if conflicts of interest exist), are absolutely necessary. That is a well settled principal of impartiality and just common sense. One can imagine the hoops the Judicial Conference jumped through to revise Sec. 106 to its current tortured flip-flopping. Even young children understand these basic concepts of fairness. In short, the opinion is four pages of ethical swiss cheese, with two shiny brass bookends that state that judges have “no duty to affirmatively monitor the underlying investments.” After this statement, the opinion contains four pages of exceptions. For example, you may have to disclose IRA's, 401(k)’s, brokerage accounts, nested holdings, number of investors, etc. The mutual fund waiver opinion is contained in the same 217-page advisory opinion that says, “Ownership of even one share of stock by the judge’s spouse would require disqualification.” Section 20-2. So which is it? Ownership of even one share dictates recusal, or you can do whatever the hell you want if you hide your stock in a mutual fund? If a family member must disclose even one $50 share, then how is that judges can avoid disclosing tens of millions of dollars just because they are held through a mutual fund. This rule makes absolutely no sense, which makes its origin suspicious. It served somebody’s intent to hide investments, clearly. In the midst of the self-defined exceptions in Sec. 106, the opinion rightly restates the law that a judge must disclose if his or her holdings would be “substantially” affected by the outcome of the ruling. If a judge wants to hide a holding of Facebook stock inside his or her Fidelity or T.Rowe Price mutual fund, then his or her opinion would be that it is not substantial, and thus self-serving. In Sec. 106, the definition of “substantial” is in the eye of the beholder. This rule is vague and duplicitous. Holdings in the biggest tech IPO in U.S. history doesn't require disclosure? Are you kidding me? The Facebook IPO was the largest tech IPO in history; valued at roughly $100 billion. Both Fidelity and T. Rowe Price held substantial pre-IPO investments that were reported widely in the press. In fact, T. Rowe held more than 5% of the pre-IPO stock in Facebook. T.Rowe's holding required specific disclosure in the S.E.C. S-1 Registration. If the Fidelity and T.Rowe Price interests held by the Leader v. Facebook judges were not substantially benefited by decisions favorable to Facebook, then this rule's so-called "safe harbor" is moot. Its existence telegraphs an attempt to fabricate excuses for illegal intent. Even if we were to accept the Judicial Policy Opinion No. 106 as legal, no justification can possibly exist for these judges and regulatory officials to assert that they would not benefit substantially from Leader v. Facebook decisions favorable to Facebook. And yet, the judges were silent, as were the regulators at the Patent Office. Note: The chief counsel at the U.S. Patent Office advising the judges on the unprecedented third reexamination of Leader’s patent, William J. Stoffel, lists Fidelity and Vanguard as two of his conflicts of interest. The Patent Office is currently stonewalling FOIA requests for background information on these judges and the Director, David J. Kappos. See "Patent Office Removes Critical Leader v. Facebook Disclosure items" by Americans For Innovation, Aug. 15, 2013. Fig. 6—Pres. 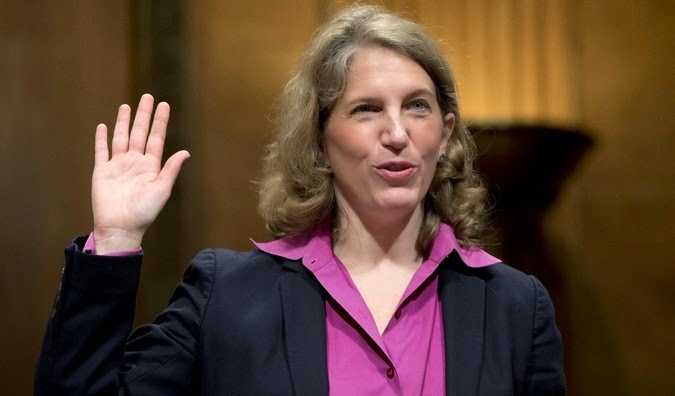 Obama nominated Sylvia M. Burwell to replace Kathleen Sebelius as Secretary of Health & Human Services (HHS). Will Burwell reveal her financial inner dolls? Click Here to download Sylvia M. Burwell's 2012 Financial Disclosure. Facebook – 9 holdings; HealthCare.gov makes claims that the technology being used is “open source,” even though Leader Technologies proved in federal court on 11 of 11 counts that Facebook infringes their invention. Baidu Inc. (China) – 9 holdings; Baidu is tied to Sands Capital, which is tied to Athenahealth; Baidu is a heavily censored Facebook clone in China financed by the same Wall Street and Silicon Valley people who started Facebook; Baidu may be using the same stolen source code from Leader Technologies, Inc.; Leader’s former attorney and Facebook’s current attorney, Fenwick & West LLP, has just placed a junior associate at the top of Baidu’s patenting operation. Athenahealth – 5 holdings; Athenahealth is a no-bid supplier of social networking technology to HealthCare.gov; founded by Todd Y.Park, the Obama White House’s current CTO , and former chief architect of HealthCare.gov; Park’s brother, Edward Y. Park; Todd Y. Park’s ethics disclosures have gone missing and these conflicts have never been disclosed. CGI, Inc. – 3 holdings; CGI is the original no-bid HealthCare.gov contractor run by Michelle Obama’s former Princeton friend. Booz Allen Hamilton – 3 holdings; Booz Allen is Todd Y. Park’s former employer and beneficiary of no-bid HealthCare.gov contracts. Accenture – 6 holdings; Accenture is the no-bid HealthCare.gov replacement to CGI, Inc.
Boston Scientific – 5 holdings; Boston Scientific is implicated in the theft of Leader Technologies’ social networking invention. Mail.ru/Yandex – 6 holdings; these Russian companies are associated with Russian oligarchs Yuri Milner and vAlisher Usmanov; these men are implicated in the laundering of TARP money into Facebook insider shares which drove Facebook’s pre-IPO valuation to $100 billion. Tesla Motors – 5 holdings; Tesla received $456 million in stimulus funds; is closely associated with Elon Musk, a contemporary of Mark Zuckerberg at Harvard, and a close associate to the Facebook cartel; Musk is a notorious contributor to the Obama political campaigns; the recommendation to fund Tesla came from Speaker of the House Nancy Pelosi's former chief security advisor, Mike Sheehy, in collaboration with Facebook's attorney, Cooley Godward LLP, Donald K. Stern; Stern also recommended Leader v. Facebook judges, Leonard P. Stark, and Harry Reid sponsored former chief counsel, Evan J. Wallach. 64 holdings in TARP and Facebook IPO beneficiaries, incl. Goldman Sachs, Morgan Stanley, JP Morgan, BlackRock, T.RowePrice, Vanguard. 47 holdings in Mainstream Media, incl. ABC/Disney, NBC/Comcast, CBS Corp, Time Warner and Fox Corp.
LinkedIn, Groupon, Workday, Dropbox – 17 holdings; these companies are closely associated with Goldman Sachs and James W. Breyer, Accel Partners, Facebook Director, Facebook’s largest shareholder, former Director, Wal-Mart. Lawrence “Larry” Summers – lurking in the background is the former director of the National Economic Council; fed tens of billions of TARP bailout funds to his cronies at Morgan Stanley, Goldman Sachs, JPMorgan; Summers mentored Yuri Milner, Digital Sky Technologies, DST, Mail.ru, Yandex, Bank Menatep, World Bank, Soviet privatization Vouchers, which directly connects him to at least six Burwell holdings; Summers also mentored Sheryl S. Sandberg, COO, Facebook, which directly connects him to the myriad of Facebook holdings shown above. Summers is now believed to have helped engineer the 2008 banking "crisis" in order to use public funds to feed tens of billions in TARP funds to his cronies; billions of dollars of which were then pumped into unregulated Facebook insider stock to boost its pre-IPO valuation. No wonder insiders judges and regulators wanted in. They were promised "once in a lifetime" returns. This has been public bribery on a never-before-seen scale. Fig. 7—Sylvia M. Burwell's 2012 OGE Form 278 Financial Disclosure, including her Ethics Statement. CLICK HERE TO DOWNLOAD. Click here to download the Microsoft Excel spreadsheet to do your own analysis. At that time, Burwell divested herself of Amazon, ING Global Real Estate, Vanguard VGSNX, Nuveen Real Estate, MetLife and Wal-Mart holdings before taking the OMB job. Will Burwell divest herself of most of her holdings before taking the HHS job? Most of her holdings have conflicting interests. Since so much of HealthCare.gov involves social networking technologies. Those technologies have been proven to be stolen from Ohio-based innovator, Leader Technologies, Inc. It should be an interesting Senate hearing. AFI researchers have offered their help in providing Burwell research. Just write us at EMAIL and we'll get it right back to you. FACEBOOK AND U.S. PATENT OFFICE HIDE GLOBAL SURVEILLANCE SCHEME? Update, Apr. 9, 2014—A complete Leader v. Facebook document library with full citations has just been released. CLICK HERE. 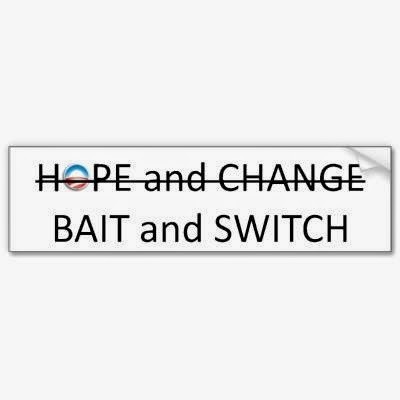 The "Grand Bait and Switch" that perverted justice in this case becomes quit apparent with the benefit of hindsight. A conclusion of judicial malfaesance is unavoidable. It is very apparent that an entire echelon of judges, bureaucrats, lawyers, bankers and politicians have been working together to protect their beloved Facebook (in addition to using the platform to manipulate the LOFO vote, stock markets, banking and establish a global surveillance system). Since certain quarters like to accuse their adversaries of unfounded "conspiracies," let's call it "pathological cronyism" instead. A duck is still a duck, no matter what you call it. Fig. 1—David J. Kappos, former director of the U.S. Patent Office, ordered the unprecedented third reexamination of Leader Technologies' U.S. Patent No. 7,139,761 after Facebook had been found guilty of infringing the patent on 11 of 11 counts. Kappos failed to disclose (1) his close association with Leader's first patent attorney, Professor James P. Chandler, III, President, National Intellectual Property Law Institute; (2) his establishment of a USPTO Facebook page during the Leader v. Facebook proceedings; and (3) his $1 million Vanguard holdings, one of the biggest pre-IPO Facebook stockholders. Why didn't he disclose these obvious conflicts of interest? Because he likely already knew that the outcome was a foregone conclusion, orchestrated by his mentor, Professor Chandler, for the benefit of the NSA and its global surveillance strategy to exploit social networks. (Apr. 4, 2014)—The Patent Office continues to stonewall requests for basic background information on former Patent Office director, David J. Kappos, and the judges and staff that he assigned to his unprecedented third patent office reexamination of Leader Technologies’ patent for social networking, U.S. Pat. No. 7,139,761. Those Patent Office people are Stephen C. Siu, Meredith C. Petravick, James T. Moore, Allen R. MacDonald, Deandra Hughes, William J. Stoffel, James C. Payne and Kathryn W. Siehndel. See Request for Congressional Intervention for more detail. The Patent Office appears to be hiding damning evidence. What does the U.S. Patent Office consider so secret about Director Kappos’ biography that they are willing to claim Executive Privilege to hide it? We asked veteran research librarians to find out more about David J. Kappos. While Kappos touts his 25+years at IBM, little is actually known about his personal activities. Despite Kappos’ high profile positions, including IBM Corporate Counsel and assistant general counsel, these librarians concluded that “the web has been cleansed of Mr. Kappos’ history." Veteran Researchers: The web info on David J. Kappos "has been cleansed"
This is the third person's activity prior to certain dates that has been cleansed from the web. The first was Mark Zuckerberg's 2003-2004 activity that went "missing." The second was John P. Breyer, the shadowy Chinese venture capital figure behind son, James W. Breyer, Facebook's largest shareholder and managing partner of Accel Partners LLP, Fenwick & West LLP's client. Wehave documentation that know that John P. Breyer founded IDG/Computer World and is a Hungarian refugee contemporary of George Soros. Ironically, despite Breyer's high profile association with Computer World, the world's computers seem cleansed of him. The researchers then started consulting their archivist sources in Washington D.C. This is when the inquiry got interesting. One source confirmed that Mr. Kappos had been heavily involved with The National Intellectual Property Law Institute in the passage of the Federal Trade Secrets and the Economic Espionage Acts in 1996. 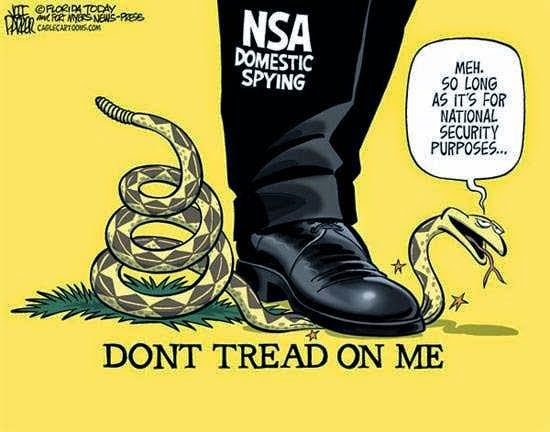 NSA domestic syping tramples on inalienable American rights to privacy and property. Then, in a turn right out of a Grisham spy novel, this Washington source cautioned the inquirers to “be careful’ because queries about Kappos’ involvement “are being watched at high levels.” This source also said that at least three similar inquiries had occurred in the last few months. This person would not elaborate on what “high levels” meant. We posit this tidbit of information as a data point for the reader. Of course, to us journalists, such warnings are like throwing red meat to a dog. The librarians consulted Kappos’ Senate confirmation hearing. GPO Summary | HTML | PDF (40MB). 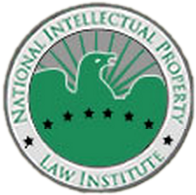 Surprisingly, Kappos failed to disclose his association with The National Intellectual Property Law Institute and its founder, Professor James P. Chandler, III, in his Senate testimony. This is a material nondisclosure. It appears to be an intentional omission. Testimony about Professor Chandler figures prominently in the Leader v. Facebook trial transcript since Professor Chandler was Leader’s chief patent counsel. We contacted Leader Technologies who confirmed that to their knowledge Professor Chandler was an important outside intellectual property counsel to IBM, and that Professor Chandler had initiated contact between Leader and IBM during the engagement. Leader said nothing ever came of the introduction, at least as far as they were concerned. Kappos also continued his failure to disclose this conflict of interest when he ordered the unprecedented third reexamination of Leader’s well-tested seven-year old patent. This patent had already been thoroughly tested at trial where Leader proved that Facebook infringed on all 11 of 11 claims, and there was no prior art. Yet magically, in the third patent reexamination, Facebook produced the same worn out prior art on which they had lost at trial and in two prior reexaminations. But this time, the patent examiner, Deandra Hughes, had an epiphany so clear and bright that she and the three-judge Board of Patent Appeals and Interferences (BPAI) panel invalidated the entire patent with the stroke of their administrative pens, without a hearing, and without a shred of legal justification. This action killed the other 24 claims of Leader's patent that had not been asserted at trial. The whitewash was complete. Social media has a creator, and deserves to be paid for their property. The strategy is now clear. In their hubris, the Facebook cartel doesn't want Leader Technologies' patent rights to be associated with social networking. They want to give it away for free. And, they will corrupt any person or law necessary to achieve that objective. The trouble is, they are breaking the law, and we are a nation of laws, not of people and their often fickle notions. Kappos also failed to disclose his substantial Facebook holdings. IBM has been highly criticized for prosecuting many of its “crappy patents” in the late 1990’s. “Unfortunately, in the past 25 years, Kappos may have forgotten that most of the world does not operate like IBM. Thus, when he says that ‘people no longer innovate individually’ or that ‘many new innovations require investments of unprecedented size,’ I worry that his vision is skewed." What are these facts telling us? A commenter asked last week, “Who’s side was Professor Chandler on?” Simple geometric logic says that Chandler was deeply involved in IBM’s litigation of “crappy patents” before Leader Technologies came along. Is the modern “patent troll" actually the brainchild of Professor Chandler’s advice to IBM? As the commentators point out, this strategy was good for IBM’s revenues, but bad for the individual inventor who doesn’t have the PR machine or influence or large prescense at the Patent Office to fight the pejorative “patent troll” moniker. Further evidence of this practice was revealed with IBM sold 750 "crappy patents" to Facebook on Mar. 22, 2012, and on Jan. 31, 2014, IBM sold Twitter sold 900 more "crappy patents." What good would these old patents be to Facebook and Twitter except to continue Professor Chandler's big infringer patent trollism, on steriods? Facebook's opening PR salvo against Leader Technologies, after Leader filed the Leader v. Facebook patent infringement lawsuit on Nov. 19, 2008, was that Leader was a patent troll. As is typical for unscrupulous people and companies, they accuse the victim of their crimes and force them to prove a negative. Ahhm. Leader proved it. This would not be the first time that IBM has been centrally involved in collecting information about a citizenry. IBM was prominent in collecting information about Jews and others in Nazi Germany. IBM’s Founder Thomas J. Watson, Sr.’s was willingly complicit in the secret collecting of census data about German Jews using IBM machines for Adolf Hitler. 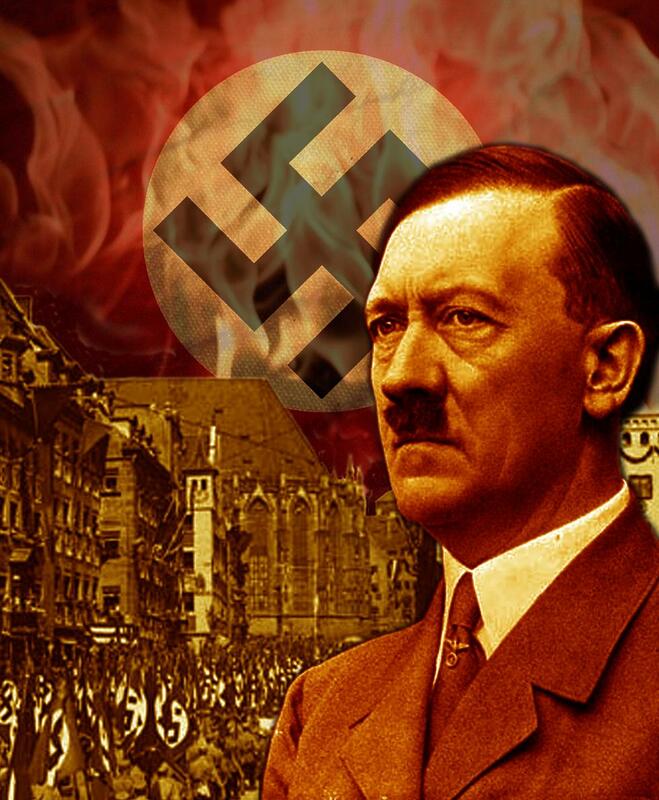 Hitler created the German Eagle Order medal during this time, and Watson was the first to receive it. NOTE: This sidebar was contributed by an American businessman who had six relatives who were murdered in Nazi concentration camps after being tagged by Hitler's IBM computers. It appears that Professor James P. Chandler, III may have been David J. Kappos’ mentor. The $64,000 question is: “Did Chandler throw his client, Leader Technologies, under the bus to enable his clients like IBM, Microsoft, Fenwick & West, and other big infringer allies to steal Leader Technologies’ innovations under some misguided notion of the greater good? Is this close association between Professor Chandler and David J. Kappos the “smoking gun” that the Patent Office is hiding? Since not a single Patent Office biography of an employee associated with the Leader v. Facebook reexaminations has been produced, this seems likely. Because, in the late 1990's, our sources knew from first hand experience that Congress required that Chandler consult to Congress, the White House, the Judiciary and even foreign governments on implementation of the Federal Trade Secrets Act. Political associations with Chandler would certainly have been sought by Kappos, corporate types being politically predictable that way. Professor Chandler's association would also explain why the White House claimed executive privilege to stonewall the Patent Office FOIA requests. They would rationalize the need to preserve Chandler's association with national intelligence strategies. However, once the researchers verified Kappos's membership in Chandler's National Intellectual Property Law Institute from two independent sources, this verified that Professor Chandler's associations were public information. Ohio innovator Leader Technologies did not fit Kappos’ (and Chandlers?) vision of “people no longer innovate individually.” This Freudian comment contradicts mountains of patronizing Kappos verbiage about his supposed priority for the individual inventor. His only priority seems to be to wrest control of small inventor creativity for the benefit of his deep pocket cronies. Patenting in American has become little more than a way for big firms like IBM to influence the USPTO, for lawyers on both sides to generate billable hours, and for the judges to help their lawyer friends. IBM created the "patent troll" pejorative as a hoax to deceive Congress into passing the America Invents Act—the greatest enemy to true innovation ever conceived. The numbers and facts don't lie. IBM proudly claims its leadership as the highest achieving patent recipient in the U.S. for the past twenty-one (21) years! Their huge footprint at the USPTO certainly gives them leverage and may even "crowd out" the little guys like Leader, and their opportunities to earn patent approvals. If there are about 250 working days at the USPTO per year, this means that EACH DAY they allowed over 27 patents per day to IBM ALONE. Facebook's investor Microsoft was awarded 2,660 in 2013. Kappos and U.S. CTO Aneesh Chopra championed the America Invents Act which packed the law with volumes of IBM-friendly bludgeons against the small inventor. Tellingly, both Kappos and Chopra held volumes of Facebook interests before the Facebook IPO. Chopra gave his approval over the claim in HealthCare.gov that Leader's social networking invention is "open source." This deception casts a deathly pall over the entire Obamacare implementation. Kappos assigned former Microsoft employee, Stephen C. Siu, as lead judge in the third Leader Technologies reexamination. Hmmm. Both Kappos and Chandler are alumni of the University of California, Davis. Leader’s first director was Major General James W. Freeze (Army, ret. ), former #3 at the NSA (See Footnote 1). Leader confirmed that General Freeze introduced Leader to Professor Chandler in about 2000. Are all these connections just coincidental? Mathematically, the odds of this are now nearly zero. Eric Snowden revealed intimate associations among the NSA and Facebook, Google, Verizon, AT&T, etc. As expected, now that the ties are public, people like Zuckerberg act out their hollow denials like Shakespeare’s Queen Gertrude in act III, scene II of Hamlet: “The lady doth protest too much, methinks." Fenwick & West LLP’s associations with In-Q-Tel, the CIA’s venture capital arm, are well known. Equally well known in Washington D.C. is Bill Fenwick’s association with Professor Chandler, confimed by numerous sources. Leader Technologies has confirmed in various interviews that they had engaged Fenwick & West LLP in 2002-2003 at Professor Chandler's recommendation. Leader Technologies: thrown under the bus by crony lawyers—is this what the violation of Leader's patent property rights was all about? Was Ohio innovator Leader Technologies thrown under the bus by their lawyers? It appears that the intelligence world had grand designs for Leader's invention. It appears that Leader’s lawyers Chandler and Fenwick may have given Leader's invention source code to Fenwick & West LLP’s client, James W. Breyer, Accel Partners LLP, Palo Alto, CA, to exploit. Besides Facebook, Breyer and Accel Partners appear to have also been central in the establishment of the Russian social network VKontackt and the Chinese social network Baidu, which all look and operate similarly. Is this because these networks were all given Leader Technologies’ source code at the same time by Fenwick & West LLP? Russian oligarch Alisher Usmanov, a Lawrence “Larry” Summers Harvard creation and partner of Facebook underwriter Goldman Sachs, owns a majority stake in VKontakt. Baidu’s CEO, Robin Y. Li, was appointed CEO in Jan. 2004, the same month that Mark Zuckerberg allegedly created Facebook in “one to two weeks.” Robin Li holds his Baidu stock in a Cayman Island company named "Handsome Reward." Former Fenwick junior associate, Parker Zhang, was recently elevated to “Head of Patents” at Baidu. Two of the three largest investors in Baidu are T. Rowe Price and Baillie Gifford, which just so happen to also be the largest investors in Facebook. Fenwick’s sister law firm in these crimes, Gibson Dunn LLP, withheld 28 Zuckerberg Harvard hard drives and emails from Leader Technologies’ during discovery. They said they were lost, yet they magically reappeared on July 18, 2012, one day after the Leader v. Facebook Federal Circuit denial. It appears that Facebook was the brainchild of an intelligence world, championed by Professor James P. Chandler, III, that was over-eager to fulfill their dreams of simultaneous global surveillance using Leader Technologies' innovations. Too bad these actors had to steal real American innovations and tarnish respect for cherished American ideals of property in the process. Now it's time to fix these injustices and provide the appropriate compensation to the true creators of the technology. Postscript: AFI readers are encouraged to do your own digging, and to share these perspectives immediately with your elected representatives and in the comments. We also ask you to notify us immediately with any inaccuracies. This article contains opinion. As with all opinion, it should be independently verified.